It has been an honor to host the Titus Task Race Event for 3 years and partner with One Heart for Justice in 2012 to expand the race event in Siloam Springs. We have witnessed our community coming together to further the cause of the orphan and it has been truly inspiring. We are so thankful to have been able to remember our son and watch God work in providing a future for more children like Titus through generous people in NW Arkansas. With the transition of the Tugwell Family moving to Haiti - the Titus Task has passed the torch to the One Heart for Justice team for future race events. The Titus Task Advisory Board is considering other fundraising events in the future. Check back for more information. 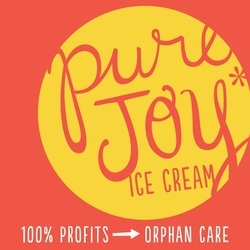 Friends of the Titus Task, Matt + Meghan Feyerabend, are using their love for homemade ice cream to make a difference for orphans. Read more of their story here and make sure to order a pint of this all natural, delicious ice cream. Pure Joy ice cream is also available at Pour Jon's Coffee shop in downtown Siloam Springs.